If you’re like me and you have a habit of occasionally reading and getting angry, as most people do, you’ll know that “bookcases” sold in stores exist only for storing a small pot of flowers and a couple CDs. Trying to store actual books on them is an absurd idea, as you will no doubt see here. It is almost always true that the older something is, the more it was built to last. So vintage or antique bookcases are always superior, and often more beautiful, but not always affordable. It may also happen that the place in which you’d like to store your books is not ideal for a bookcase. So this, Strangers, is why I built my own, and why you should consider doing so too. First of all, this shelf is built right into the wall, instead of being a standalone book case. So to give it a more “complete” look as opposed to something just floating (which is still not at all a bad choice) I covered the wall where the shelves would be with an accenting wallpaper, which came in a little roll at Walmart. Our living room is a beautiful grey-blue, so for the wallpaper I chose a distressed silver damask. I would also love to make a second accent with this above the mantle, but that will be for another day. The exact height of the paper doesn’t really matter. I matched mine up with the light switch and thus is looks somewhat like a back splash. You may want to get some help with this, because putting it up is very awkward. Consider it a team-building exercise. A shelf I built 8 years ago with bird feeder hangers, and a great place to display my sword. Next up, the brackets. To know how far up the shelves need to be from each other, measure with your largest book. That way you’ll know that all of your books will fit and won’t have to be placed front end down, because that’s annoying and you can’t easily see what the book is that way. As far as horizontal distance, we placed each bracket more towards the center than on the absolute edges of the space to prevent bowing of the shelves. The longer your shelves are of course, the more brackets you’ll need. You can get these at different price points from Home Depot, but years ago I used beautiful wrought iron bird feeder hangers that cost just $2 each, so keep in mind that improvising is totally ok here. Remember also to use a level. For our own shelves we salvaged what was left of the old bookcase, but barring any available scrap you can get some small sturdy shelf boards from Home Depot or even better just cut some solid wood to size and stain it the shade of rich mahogany, or whatever color you prefer. You don’t absolutely need to secure the boards to the brackets. We didn’t. You’ll see here that although we used a level, the boards appear to be slanted. This is because the actual house is slanted, so what can you do. Because our baseboards are quite high and we didn’t want to ruin them with holes, we used the baseboards themselves as a support system for the bottom shelf. To prop up the remaining corner we piled beautiful yet totally useless old dictionaries to the correct height. If your house is similar to ours in this way you can do the same thing, and use anything you like here, like a pretty dowel or a skull. Speaking of skulls, no spooky library is complete without one, so among some of the decorative features I placed on the shelves is a beautiful skull candle. The wax inside is red so it looks like it’s bleeding when you light it, but we thought it was just too pretty to burn. Don’t overdo the decorations though, this is a place for books after all. If your decorative items are heavy and unbreakable enough you can use them as book ends. Just to be sure though I used some cheap standard ones I got from Staples. You’re going to need book ends if your shelf doesn’t have sides! 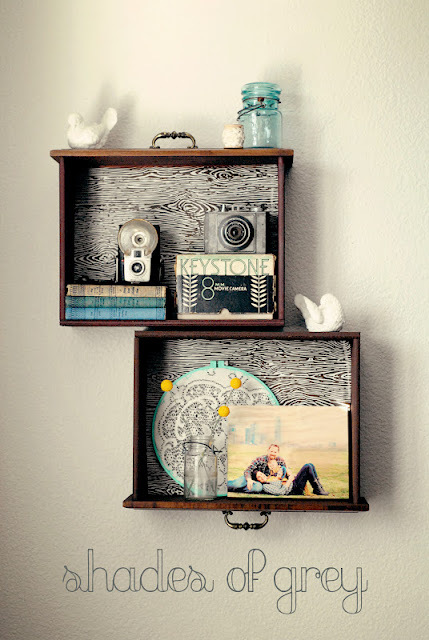 Creating shelf space in this way doesn’t have to be just for books, and is ideal for small spaces. We did this for night stands, and you can also put a very long shelf on the wall behind your couch to act as a console table or end table. You can even create a lovely little surface by lining an old drawer with beautiful wall paper and hanging it vertically on the wall as you can see in this lovely example. Of course once I do this I’ll probably still fill it with books. I had a goal to read 30 books last year, as I’ve been doing every year. This year I made it to 29. So close! Let’s take a look at the list and my basic impressions. 1. Freakonomics, completed January 5th. This book was really fascinating. 2. The Burlesque Handbook, completed January 20th. Excellent primer for burlesque beginners. This will come in handy. 4. The History of Marriage, completed April 19th. As a married nerd this was a must. Don’t let the gap fool you; this was a great book including bits and pieces on the history of women, family planning, and even racism. 5. Lady Almina and the Real Downton Abbey, completed April 22nd. A great book a la Lives of the Rich and Famous circa 1890-1925. 6. The Uninvited: The True Story of the Union Screaming House, completed April 23rd. I was told this book would be scary. It was not. But despite this and the amateurish writing, I still really liked it. 7. Absolute Monarchs: A History of the Papacy, completed May 4th. Well done, but this was just information overload. Only really suitable for minds like a computer. 8. Halloween: From Pagan Ritual to Party Night, completed May 10th. A little disappointing, but only because the history of Halloween is not very spooky. 9. The King’s Speech, completed May 19th. Unlike the movie, this was a double-biography. 10. The Nun’s Story, completed May 29th. I don’t always read fiction, but when I do it’s the best fiction ever. 11. Edison and the Electric Chair, completed June 7th. Parts of this were shocking! 12. Life is So Good, completed June 13th. A super sweet, heartwarming, inspirational book. 13. Under The Black Flag, completed June 21st. The author didn’t seem to care about his subject, so neither will you. 14. Hubbub: Filth, noise & Stench in England, completed June 30th. History is totally gross, you guys. 15. Paranormal State, completed July 15th. Everybody needs to lay off Ryan Buell. He’s a cool guy with a cool book. 16. The Six Wives of Henry VIII, completed August 7th. Antonia Fraser is a great writer. Also, I think she is a time traveler. 17. Life in a Medieval Village, completed August 11th. Totally informative, but totally dry. 18. In The President’s Secret Service, completed August 18th. A guilty-pleasure read with a moral purpose. 19. Deliver Me From Evil, completed August 20th. Powerful. 20. Carny Folk, completed August 24th. More than just a fun primer on sideshow standouts. 21. Lords of Misrule: Mardi Gras and the Politics of Race in New Orleans, Completed September 21st. Mardi Gras used to be totally racist, Strangers. Unfortunately this book was mostly pretty dry. 22. U.S. History for Dummies, completed November 17th. I kind of tuned out after the 1960s, but it was definitely helpful. 23. The Corset: A Cultural History, completed November 20th. This book goes way beyond girl fashion. 10/10, would recommend. 24. Mirror, Mirror, Off The Wall: How I Learned to Love My Body by Not Looking at it For a Year, completed November 24th. It’s a sociology book, and it’s very insightful. 25. Jack The Ripper: Murder, Mystery and Intrigue in London’s East End, completed November 25th. Quick and dirty. Or, make that messy. 26. How the States Got Their Shapes, completed November 28th. The TV series is way better. 27. The Worst Hard Time: The Untold Story of Those Who Survived the Great American Dust Bowl, completed December 3rd. The depression was really depressing. At least the writing this inspired is beautiful. 28. This Republic of Suffering: Death and the American Civil War, completed December 17th. Wars are political, but the content of this book was not. It brought a ton of humanity and new perspective to a distant time in American history. 29. The Complete Works of Edgar Allan Poe, Century Edition, Volume 4. This book is about 80 years old so I could not find an accurate link to it. I have to ask, WTF were you smoking, Edgar? This wasn’t dark, it was just plain weird. Well, that’s all for 2013. This year’s lineup consists of women’s studies, black history, atheism, and the dark and spooky. You can check out my updated to-read list here. Let’s hope I can actually make it to 30 this time.